1. Define psychology and discuss the issues that shaped psychology’s evolution over the past century and a half, including the influence of philosophy and physiology. 2. Describe the roles played by Wilhelm Wundt and William James in the establishment of psychology as a separate scientific discipline. 3. Identify the founders of structuralism and functionalism, and compare and contrast their key ideas and goals. 4. Identify four early American psychologists who were students of William James or Edward Titchener, and list their contributions to the development of psychology. 5. Identify the founder and describe the key ideas of psychoanalysis. 6. List three key figures in the development of behaviorism, and describe behaviorism’s basic assumptions and goals. 7. Identify two advocates of humanistic psychology, and note how humanistic psychology differs from behaviorism and psychoanalysis. 8. 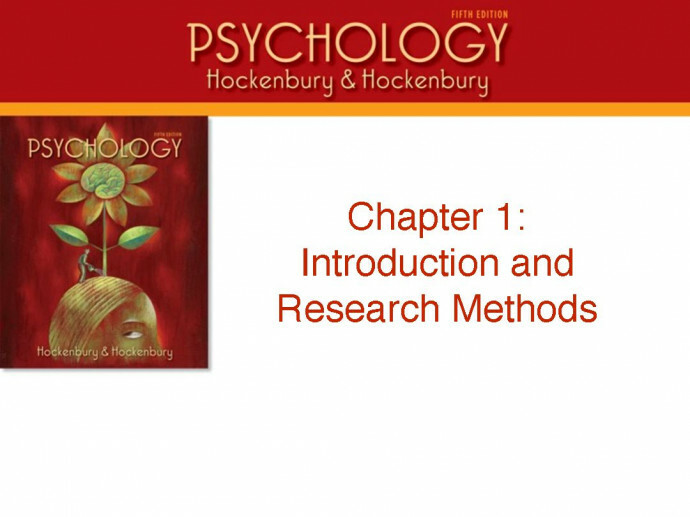 List and describe the eight major perspectives in contemporary psychology. 9. Explain the importance of cross-cultural psychology and distinguish between individualistic and collectivistic cultures. 10. Explain the basic assumptions of the evolutionary perspective. 11. List the specialty areas in contemporary psychology, describe the focus of each, and distinguish between psychology and psychiatry. 12. List the four goals of psychology, explain the scientific assumptions and attitudes of psychologists, and describe critical thinking. 13. Describe the scientific method, note the difference between a hypothesis and a theory, and explain the importance of operational definitions, replication, and statistics. 14. Define descriptive research methods, and describe how naturalistic observation and case studies are conducted. 15. Define the term pseudoscience and explain how to recognize and evaluate pseudoscientific claims. 16. Describe survey research and list the criteria that must be met for survey results to be valid. 17. Define correlation coefficient, explain the difference between positive and negative correlations, and describe the functions and limitations of correlational research. 18. Define and explain the function of the, independent variable, dependent variable, extraneous variable, experimental group, and placebo control group in an experiment. 19. Define placebo, placebo effect, main effect, and explain the purpose of random assignment, the double-blind technique, the control group or control condition, and how demand characteristics and practice effects can influence experimental results. 20. Identify the hypothesis, independent variable, dependent variable, experimental group, and control group in the experiment testing the relationship between perceiving work as exercise and health benefits and critically evaluate the results of the experiment. 21. Describe and discuss the variations and limitations of the experimental method and explain what a natural experiment is. 22. Describe the major provisions of the APA’s code of ethics for research with human and nonhuman animal subjects. 23. Name and describe the major imaging techniques used to study the brain and list their limitations. 24. List and discuss the issues related to the use of animals in psychological research. 25. List criteria that should be used to evaluate media reports about psychological findings and topics.